Monoculture is not taking into account the complexity of ecosystems, but uses an absurd over-simplification: any substrate(or none) for the roots, water and weighed fertilizers, and minerals ..
Permaculture produces durable and environmentally responsible products and services for people and communities by designing and using the environment awareness. Perma (nent agri) culture emerged late 70s in Australia by insights of Bill Mollison and David Holmgren, especially as counter movement against monoculture agriculture (desertification and soil erosion), and contamination of groundwater by fertilizers and pesticides. Plants and animals have evolved together over millions of years. Together, sometimes at the expense of each other, sometimes in symbiosis. Our monocultures impoverished and dislocated this rich collaboration and interdependence. Plants live in communities, not in monoculture. Plant sociologists and -ecologists investigate this relationship and symbioses. Actually, we know very little about this yet. Also, not about involvement and influence of insects, bacteria and fungi. In good ground live 75 million bacteria per gram. And 50 to 100 earthworms in 1 m³. At a beech you must plant beech soil containing fungi that live together with the tree. Many orchids grow only in conjunction with a particular mold. 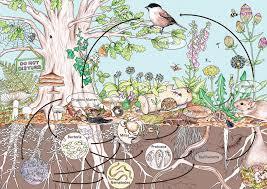 Permaculture exploited natural ecosystems and traditional small-scale food production systems. It distinguishes itself of also based on ecological organic agriculture and horticulture through the use of perennial plants (climax vegetation) and the lack of crop rotation and yearly tillage operations. Permaculture embraces more than just food. It aimes at small-scale self supporting farming. For growing plants, fruits and seeds is thought three-dimensional, and worked in several layers: trees, shrubs, herbs, groundcovers, roots and tubers, creepers. This creates a kind of jungle garden with many plant associations. Important principles are: let the soil as much as possible undisturbed, and covered. Provide a lot of diversity. Masanobu Fukuoka also cultivated the non-doing method. Let nature take its course as much as possible, playing in on it. Also to save space you can apply principles of permaculture. Sepp Holzer makes steep ridges of 1 to 1.5 m high to seed and plant. If you make on a strip of land of 3m wide 2 hillings of 1.5m high you double your working surface. The raised beds with wood infill are also called hugelkultuur. A typical permaculture use is mulching: covering the soil with organic material. Through the layer of leaves, sawdust, straw, dead plant matter, no light can reach the ground, causing less weed germinates and grows. Also the dead organic material holds good moisture making the soil dry out less quickly. In winter, this layer protects the roots from frost damage. Micro -organisms digest the material, it is converted into nutrients. So mulching has many benefits and it will save you a lot of hoe work.